Abodebed has become actively involved in an amazing grant scheme for local SMEs, Dacorum’s Den. The scheme will work in a similar way to the TV programme Dragon’s Den, where small business owners will pitch to a panel of successful entrepreneurs and business people in the hope of being awarded a £1,000 grant. For a small business or start-up, this can make a massive difference. 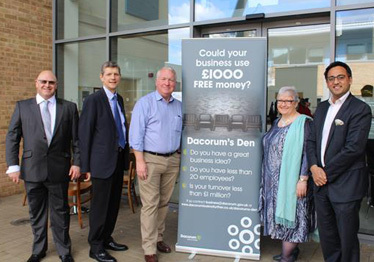 Dacorum Look No Further has run Dacorum’s Den annually for the past four years and given a total of £40,000 in grants which have lead to the creation of an incredible 27 jobs. On the judging day of Dacorum’s Den, the ten short-listed candidates will have the opportunity to present their pitch to the judges to try and win at least £1,000 of the £10,000 on offer. It’s by no means certain that a business will receive a grant – the judges are looking for fully formed plans for the money which will positively benefit the company and which simply wouldn’t be able to be realised without it. If the judges feel they don’t want to give a grant to a company, they can redistribute the rest to those they feel would benefit more from it. Unlike Dragon’s Den, it’s not obligatory for any judge to offer to mentor one of the businesses, but offers have been made in the past. After the judging, all the entries to Dacorum’s Den will be forwarded to all the judges in case they spot potential for mentoring or new partnerships. The deadline to apply for a grant via Dacorum’s Den is midnight on Sunday 5 June. Good luck!